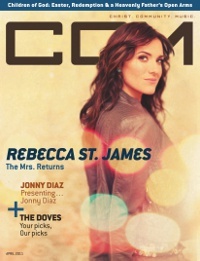 You can hear Rebecca St. James live at The Cove on Aug. 11. Tickets are still available. Contact us today to reserve your seats. First of all, make sure your life backs up your words of proclamation. If people don’t see it in your life and in your attitudes, no matter how well you present the Gospel, your words will fall on deaf ears. Second, listen to the other person. Ask him or her, “What is your spiritual journey?” Do this before you share your own. This communicates that you care. Third, declare biblical truth within the context of your own testimony. I share my story, but I proclaim truth within it. Next, be ready to defend your faith. As 1 Peter 3:15 says, “Always be prepared to give an answer to everyone who asks you to give the reason for the hope that you have. But do this with gentleness and respect” (NIV). Which simply means, when somebody asks, “Why do you believe in Jesus?” give an answer. “Why do you believe in the Bible?” Give an answer. But when you witness, make sure you use Scripture because God promises to honor His Word. And finally, call for a decision. That’s where most people miss out. We tell our story and everything else, but we don’t ask for a decision. That’s essential! You can learn more from Josh when he leads “Unshakable Truth, Relevant Faith” at The Cove. Click here to learn more. *Excerpts from a recent interview with Decision magazine. 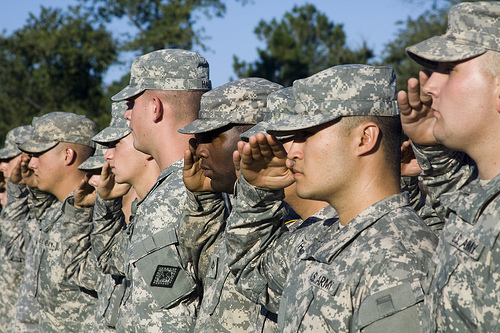 To honor the brave men and women in uniform and their service to our country, the Billy Graham Training Center at The Cove is pleased to offer full scholarships for active-duty military personnel and their spouses to attend a Cove seminar. Come and be renewed through encouragement and sound biblical teaching from respected Christian speakers, while also enjoying plenty of time and space to be alone with God in the quiet seclusion of this mountain retreat. Photo from Flickr by USACEpublicaffairs. If you, or someone you know, is currently in active military service or is a military chaplain with the North American Mission Board, please visit www.thecove.org or call (800) 950-2092 to inquire about these special scholarships! “Young people are alarmingly walking away from the church in droves. Probably 80 percent,” says Josh. And, this is what propels him to travel the globe, sharing the hope that can only be found in Christ. We as believers need to be prepared and equipped to impact our children and grandchildren for Christ. This exactly what will take place at The Cove July 15-17. Josh, and his son Sean, will lead a seminar called “Unshakable Truth, Revelant Faith.” A few spots are still open! 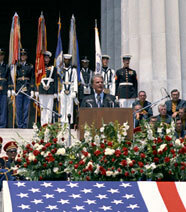 As the turbulent ’60s concluded and a new decade began, Billy Graham appeared at a July 4th event in Washington, D.C. called Honor America Day. We may be a vastly different people today than we were 200 years ago. … But of this we can be sure. God has not changed and His laws have not changed. More than 400,000 people attended, while millions watched on television or heard it on the radio in 123 other countries. Bob Hope, Dinah Shore, Jack Benny, Glen Campbell, The New Christy Minstrels and Teresa Graves were among those who performed that day. The idea reportedly stemmed from a telephone conversation between Billy Graham and Hobart Lewis, editor-in-chief of the Reader’s Digest, with hotel executive J. Willard Marriott later taking over the bulk of organizational work. “Pericles built a civilization upon culture and it failed. Caesar built a civilization upon power and it failed. Our forefathers founded the United States upon faith in God, and our country will survive only as it honors God. “Our nation was built on a foundation of moral law, in which a person’s rights were also balanced by a person’s responsibilities. Why should I, as a citizen of heaven and a Christian minister, join in honoring any secular state? “The Bible says, ‘Honor the nation.’ As a Christian or a Jew, or as an atheist, we have a responsibility to an America that has always stood for liberty, protection and opportunity. “There are many reasons why we honor America today. America has opened her heart and her doors to the distressed and persecuted of the world. America has been the most generous nation in history. We have shared our wealth and our faith with a world in need. “We may be a vastly different people today than we were two hundred years ago. Our society is far more complex, more pluralistic. But of this we can be sure. God has not changed and His laws have not changed. “The chief end of man is to glorify God and enjoy Him forever.” This quote is what worship is all about, says Rebecca St. James. And, that’s the focus of her latest album entitled I Will Praise Him, which was released this spring. Australian born St. James has become one of Contemporary Christian Music’s most enduring and beloved artists, embraced by audiences worldwide. Her signature sound yielded 17 Top 10 singles (nine of which were No. 1) and two RIAA Gold Album certifications (commemorating sales of more than 500,000 units) for God (1996), as well as GRAMMY winning Pray (1999). You can experience Rebecca St. James live at The Cove on Aug. 11. Contact us today to reserve your seats! Do you know what you believe and why you believe it? The answers to these questions shape how we live our lives. We cannot live out God’s purpose for our lives until we understand what it is and how it should be reflected in our lifestyle. July 15-17, renowned author and apologist Josh McDowell, along with his son Sean, will join us for a special seminar entitled “Unshakable Truth, Relevant Faith.” The content for this special study is based on their new book “The Unshakable Truth” which explores the 12 foundational truths of the Christian faith, why they are credible and how they are critical to living out what you believe. Unshakable Truth – Promo – Josh & Sean from Josh McDowell on Vimeo. Space is still available for this specially priced “Next Generation Retreat.” Contact us today at (800) 950-2092 to learn more. Recently, our friend Carolina Mama visited The Cove for a weekend. Stop by her blog to see what she had to say about her time of refreshment at The Cove. Our friends from 106.9 The Light interviewed Matthew West this morning – he talked about what fans can expect at his concert at The Cove tomorrow. In addition, he discussed his upcoming Christmas album, life in Nashville and his experiences with the Billy Graham Evangelistic Association, Samaritan’s Purse and Operation Christmas Child. A few tickets still remain for his concert tomorrow night at The Cove. We hope you can join us. You can find more information here. This Thursday, our friend Matthew West will be joining us for An Evening at The Cove. Matthew’s latest single, “Strong Enough,” has spent 11 weeks on the Billboard Christian music charts. This song was inspired by a single mom, Tonia, and the story of her daughter, Haleigh, who was home visiting from college when she was in a devastating car accident. After 13 surgeries in three years and being forced to give up her college aspirations, Haleigh was very frustrated. “The Lord doesn’t put anything on us that he doesn’t think we are strong enough to handle,” Tonia told her daughter. “Oh yeah? Well, he must think I’m pretty FREAKIN’ STRONG!” was Haleigh’s honest reply. That story led Matthew to pen the song “Strong Enough.” The song ultimately draws its inspiration from Philippians 4:13 and the simple truth that we don’t have to be strong enough. In fact, we are not strong enough … but God is! Join us on Thursday when Matthew will sing this and other hits from his album The Story of Your Life.